If you’ve been following the news in Baltimore lately, you know that a major campaign is underway to save the Read’s Drug Store building from demolition. 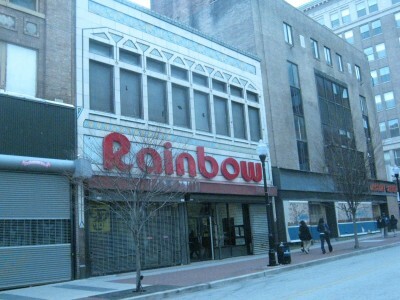 Part of the West Baltimore downtown shopping district “Superblock” slated for redevelopment, Read’s was the site of an historic civil rights protest in 1955, when a group of Morgan State college students conducted a sit-in at the lunch counter, a full five years before the famous lunch counter sit-ins in Greensboro, North Carolina. 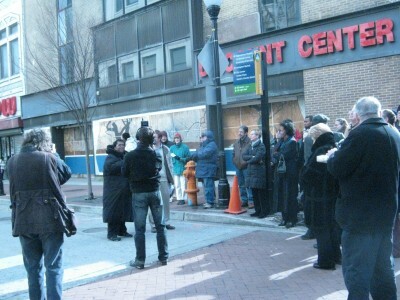 Last month I went on a walking tour of the Superblock sponsored by Baltimore Heritage, Inc.
Read’s Drug Store is the building on the right. Read’s Drug Store had been owned by the Nattans family since 1899, when Arthur Sr.’s father purchased the original downtown store from druggist William Read. A German Jewish family that had first settled in Washington, D.C., the Nattans moved to Baltimore and became active in Jewish institutions such as the Suburban Club and Levindale. 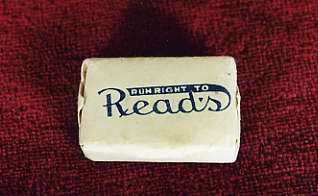 By 1934, the family had forty drugstores in operation in the Baltimore-D.C. area. That year, the Nattans completely rebuilt and remodeled the original Read’s into the Art Deco building that exists under threat of demolition today. The family sold its chain to Rite Aid in 1977. 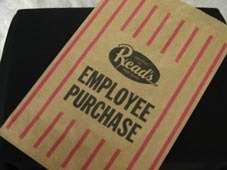 Paper bag with the "Read's" logo and EMPLOYEE PURCHASE across front, from the collection. 1990.160.003. And the rest is history: Baltimore history, civil rights history, even Jewish history. Let’s hope that city officials recognize the importance of the Read’s store—and the other historic buildings on the Superblock—and redevelop the West Side by building on our heritage, not by tearing it down. I grew-up near the reads store on maiden choice lane,I was born in 1959.The store had a restaurant,and long kitchen counter.As a kid I spent alot of time in the reads or the Arbutus- shopping-plaza,where it was located.In the 1960’s it was a more civil society,to live in,compared to the last four decades.The restaurant side was sold to carrolton-bank in the 1970’s,and the store was never the same as it once was. 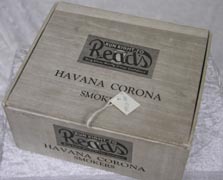 Ple3ase advise where the “Read’s Collection” is located. Hi Steve – while the Museum does not have a specific “Read’s Collection,” the objects featured in this post are part of our collections. For more information, please contact Joanna Church, our Director of Collections and Exhibits at jchurch@jewishmuseummd.org.